Monitoring Water Quality is a practical assessment of one of the most pressing growth and sustainability issues in the developed and developing worlds: water quality. Over the last 10 years, improved laboratory techniques have led to the discovery of microbial and viral contaminants, pharmaceuticals, and endocrine disruptors in our fresh water supplies that were not monitored previously. 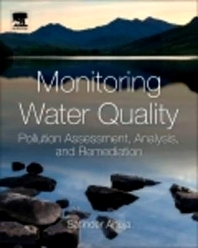 This book offers in-depth coverage of water quality issues (natural and human-related), monitoring of contaminants, and remediation of water contamination. In particular, readers will learn about arsenic removal techniques, real-time monitoring, and risk assessment. Monitoring Water Quality is a vital text for students and professionals in environmental science, civil engineering, chemistry — anyone concerned with issues of water analysis and sustainability assessment. All who deal with water analysis and water sustainability assessment, i.e. chemists, chemical engineers, environmental scientists/engineers, civil engineers working in the water management and resources and hydrologists. Academics and students (graduates will use this as a reference book). It could also be used in advanced water quality courses as more and more universities introduce courses on water related topics. 14.2 Where Do the System Vulnerabilities Lie?